Kellogg Community College’s Women’s Basketball team won its latest home game 78-59 against St. Clair County Community College on Wednesday. Leading the Bruins on the court were sophomore Destiny Kincaide, who had 28 points, 5 rebounds and 3 assists; sophomore DeeDee Post, who had 13 points, 3 assists and 4 steals; freshman Kameron Haley, who had 9 points and 4 assists; and sophomore Jessalynn Genier, who had 5 points, 14 rebounds, 5 blocks and 3 assists. Immediately before the start of the game, KCC recognized former Battle Creek mayor Al Bobrofsky, who officiated the College’s first basketball game in 1966. The ceremony continued celebrations breaking in KCC’s brand-new Miller Gym, which officially opened this summer. 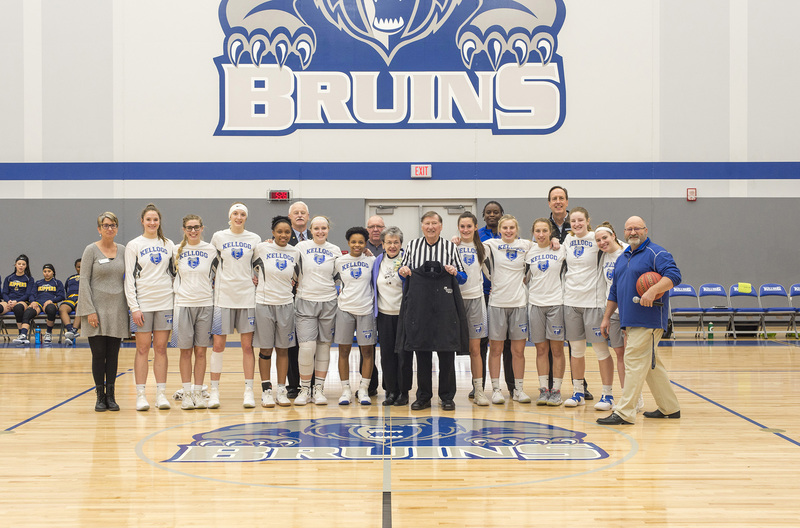 In the photo above, Bobrofsky, in the referee shirt, poses with his wife Ann, KCC’s women’s basketball team, coaches and KCC officials, including KCC President Mark O’Connell, KCC Foundation Executive Director Teresa Durham and KCC Athletic Director Tom Shaw. Click here to see more photos from the ceremony on KCC’s Facebook page. The recent win brings the Bruins’ overall record for the season so far to 2-5. The team plays next starting at 5:15 p.m. Tuesday, Dec. 11, against Calvin College’s JV team in Grand Rapids. The Bruins’ next home games starts at 5:30 p.m. Thursday, Jan. 3, against conference opponent Glen Oaks Community College in the Miller Gym.